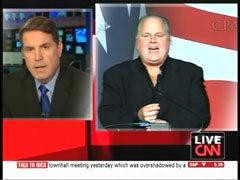 As reported on NewsBusters on Friday morning, CNN anchor Rick Sanchez read his apology on Friday’s Newsroom for running a unconfirmed quote attributed to Rush Limbaugh earlier in the week on October 12 [audio available here]. SANCHEZ: Earlier this week, we provided quotes attributed to Limbaugh to illustrate why some people and players felt that he was too divisive to be a NFL owner. It was one of the stories we did earlier this week. One of these quotes, which was in a column in the St. Louis Post Dispatch, and taken from a book largely about conservatives, was refuted by Limbaugh. I mentioned that to you Tuesday. We have been unable to independently confirm that quote. We should not have reported it- not have reported it- without independent confirmation, and for that I apologize. I feel it’s important on this show to hold folks accountable whenever they make mistakes- that’s what I try to do- and you know what? That should include myself and that should also include my team. It’s important to let you know that. Sanchez also issued an apology in August 2009 for claiming that Senator John McCain stated that the Republican Party needed to recruit “competent” Hispanics, a term which the Arizona politician never used.